Help us protect and preserve America's wild horses and burros. Some of America's last truly wild horses live on our western public lands. They live in deeply bonded family bands within a complex society of intricate realtionships. And they are in danger of being 'managed' into extinction. 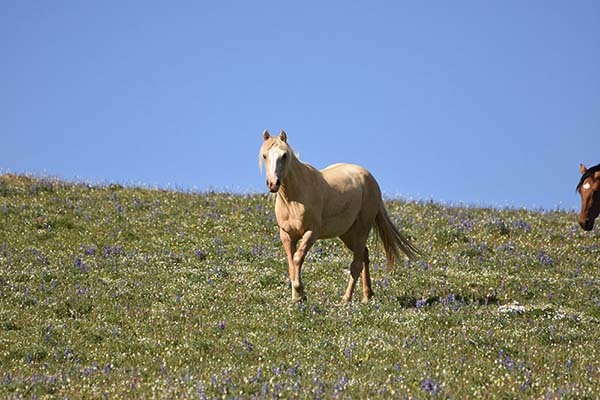 The Cloud Foundation is a Colorado 501(c)3 non-profit organization that grew out of founder Ginger Kathrens’ knowledge and fear for wild horses in the West. "I began to realize that we were losing America’s wild horses. They are rounded up by the thousand, losing in an instant what they value most–freedom and family." She realized that even the iconic stallion Cloud and his family, made famous through her own Nature series documentaries, were in danger. We could lose these herds forever, unless we’re willing to stand up for them now. The most effective way to help us keep our American icons wild and free is to donate. Your donation will go toward supporting humane on-the-range management programs, The Cloud Foundation legal fund, caring for our Freedom Family, critical documentation of the Pryor Mountain herd, film production, and more. We are a Gold rated nonprofit on GuideStar, so you can trust that we will be transparent about our spending, and we'll be good stewards of your gift. Help us communicate with lawmakers, submit comments to the BLM, attend an adoption, or get to a roundup and help us document the experience. Click below to learn about current events. Be sure to read our press releases, our comments, and our social media feed to get the TCF point of view. The best way to understand the issue of wild horse and burro management is to get on the range and see them for yourself. Find a herd near you. TCF Executive Director Ginger Kathrens spends an incredible amount of time in the wild with these beautiful herds, filming them, getting to know them, and learning about their families and social life on their home turf. Read her firsthand accounts from her time with these beautiful animals in the Pryor Mountains - the home of Cloud's herd, and where TCF's story began.